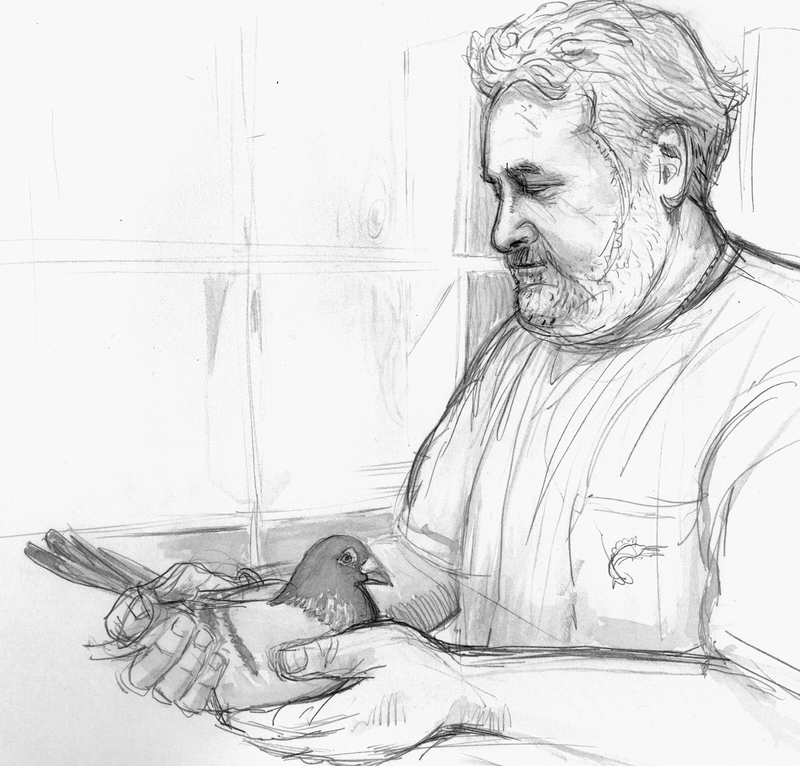 I had fun doing the illustrations for The Pigeon Guys: Recollections of Vinnie Torre and Lynne Earing. Click on the title above to download the entire 40 page book in pdf format for free. It is part of the Vanishing Hoboken Series, made possible by a grant from the John Wiley & Sons Publishers, and in this case, the Hudson County Pigeon Club. The text is an edited version of a Lisa Sartori’s interview of Vinnie and Lynne. The art director/designer is Ann Marie Manca. Bob Foster contributed additional photos. The Hoboken Historical Museum publishes this wonderful series of little booklets on all things Hoboken. You can also download more chapbooks including my favorite title- I’d Rather Lose a Clam than a Customer, Recollections of Michael “Brother” Yaccarino. The Hoboken Oral History Project is edited by the brilliant Holly Metz, who years ago collaborated with famed illustrator Sue Coe on the graphic novel How to Commit Suicide in South Africa. I used to live in Hoboken, so I drove in to see my brother Brain and he joined me for a tour of Vinnie’s loft one spring morning. Vinnie and Lynne graciously posed for sketches and told us some amazing things about pigeons. For example, mother pigeons nurse their young! I know it is unbelievable, but go ahead google pigeon milk, or ask your local ornithologist. That morning in Hoboken reminded me why I love illustration, because it is about sharing interesting stories. Thanks, I was impressed with the ease of download.